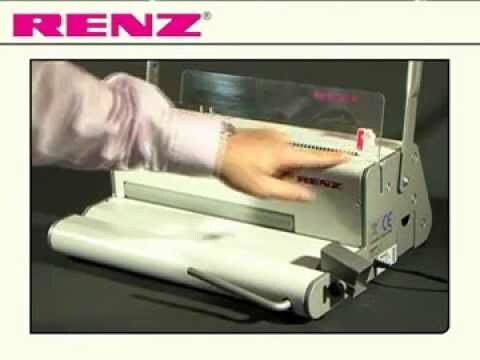 The RENZ SPB 360 provides a basic solution in spiral binding for low volume office usage. Spiral binding is the traditional way to bind loose leaves. Robust and versatile, the binding opens flat, stays flat and allows 360 degree rotation. SPB 360 is a manual operated punch with an electrical spiral inserting unit and an integrated spiral cutting and crimping unit. The spirals are easily inserted into the pre-punched book by means of an electrical drive. The integrated spiral cutting and crimping unit perfectly cuts and crimps the plastic spiral ends. Metal spirals can be cut but using pliers. Designed to give the most efficient workflow. The modular construction of the SPB 360 allows it to be upgraded to an SPB 360 comfort, electric punch and electrical spiral inserting unit by the simple addition of an electric punching module. The SPB360 has an integrated spiral cutting and crimping unit (only for plastic spirals). Compact construction with high stability. Quality made in Germany.